With 35,900 farms and 15 million acres of farmland, Washington State is known all over the world for its agricultural products and food production capabilities. Washington’s agriculture industry ranks 2nd in the nation producing 300 different crops. Washington is a leading producer of numerous fruit and vegetable crops, making our state a key supplier of food for domestic and export markets. Our growers feed people across the U.S. and around the world. The agriculture and food manufacturing industry is a cornerstone of Washington’s economy in both rural communities and metropolitan areas. environments allow for businesses to expand, grow, and prosper here. continue to raise the State’s reputation around the world. 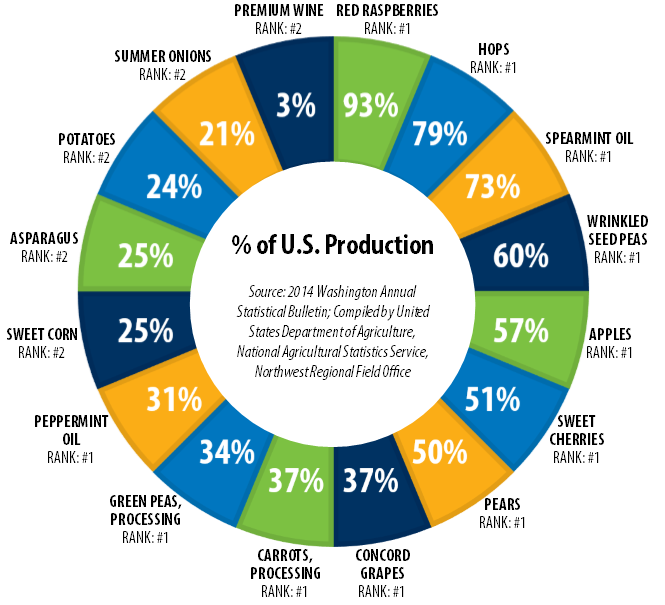 Agriculture and food and beverage production supports an estimated 164,000 jobs in Washington and accounts for approximately $20.1 billion in revenue. The State is the leading producer of apples, sweet cherries, concord grapes, hops, pears, red raspberries, and spearmint and peppermint oils, which are shipped around the globe to customers who appreciate their quality, flavor, and value. Washington is also a leader in seafood production, second only to Alaska in shipments of fish and shellfish. Washington State is equidistant from Europe and Asia, connected by 75 public ports, 139 airports and 3,666 miles of railways, ensuring that your crops and food and beverage products arrive at their destination quickly and in good order. About two-thirds of all Washington agricultural exports are destined for Asia. Ships can arrive up to two days sooner in key ports such as Tokyo and Busan. Airfreight can arrive in Beijing in less than 15 hours. Japan, Canada, China/Hong Kong, Philippines, and the Korean Republic are the top five markets for Washington agricultural exports. incentives to companies who wish to do business in and with Washington State, including tax exemptions and deductions for manufacturers of fresh fruit and vegetable crops. Plus, the state doesn’t have a corporate or personal income tax, making it an attractive place to open new factories and production facilities. See why the Tri-Cities is Fresher, Faster, and Bolder! 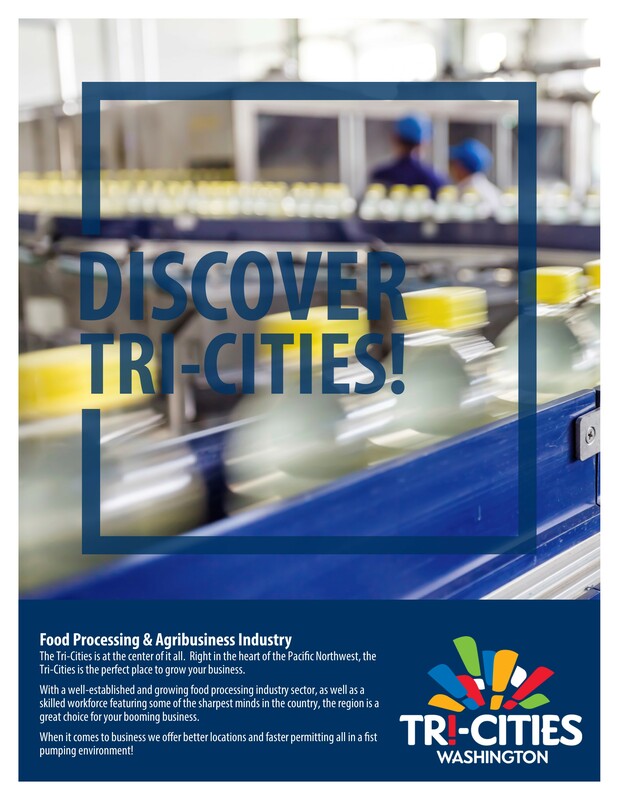 The Tri-Cities anchor the region’s economy in agribusiness, food processing, specialized services, production technology, government, and healthcare. Successful Agribusinesses include ConAgra Foods, AgriNorthwest, Broetje Orchards, Tyson Foods, Reser’s, Columbia Crest Winery and many others. The Tri-Cities MSA is especially attractive to successful, expanding companies looking to locate branch operations and develop new facilities. Since the Tri-Cities is the regional capitol for variety, freshness and quality in agriculture commodity and specialty crops/value-added processing, existing companies thrive here, and newcomers will benefit and prosper in the robust business environment. Agriculture thrives on the rich soils, diverse microclimates and large-scale irrigation systems in the region. Processors are surrounded by one of the most productive growing regions in the world, choosing from some 300 crops each year. Locally available raw materials mean a trustworthy supply, lower costs, and fresher materials. The Tri-Cities area has over 175 food and beverage manufacturers, ranging from ConAgra and Tyson Foods with 1,000+ employees each, to family-run wineries and microbreweries. Recent additions and expansions by many of these firms illustrate the attractiveness and effectiveness of a Tri-Cities location for food and agricultural processing. "Lamb Weston values the significant benefits of doing business in the Tri-Cities and has done so for nearly 40 years. Prime growing conditions, irrigated agriculture, access to international ports, and a knowledgeable workforce are just a few of the reasons the Tri-Cities is uniquely suited for growing and producing our quality potato and frozen vegetable products." Selected business costs over 24% below typical or national average costs. 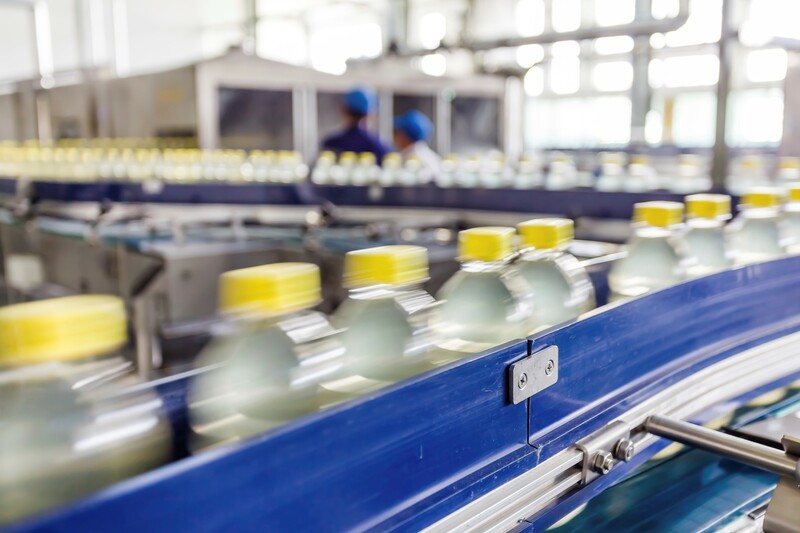 Projected costs for personnel, land, construction, energy, utilities, and certain other expenses of operating a food processing plant in the Tri-Cities compare favorably to the US and West Coast. A very competitive cost of living. 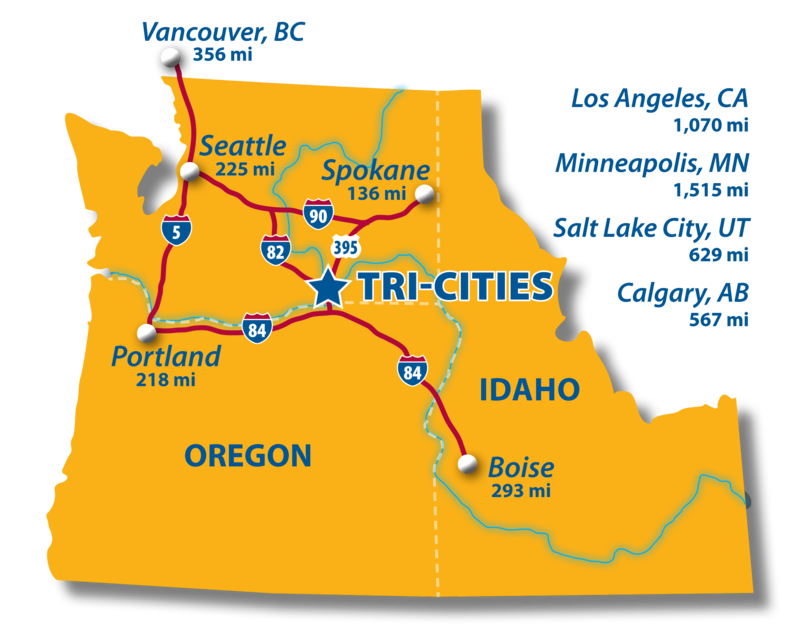 The Tri-Cities is one of two metropolitan areas in Washington and Oregon with a cost of living index below the national average. A study of business taxes imposed by selected states and communities across the U.S. show a Washington location to rank eleventh least expensive. Outstanding infrastructure for food and agricultural industrial activities. Both private and publicly-owned industrial parks are designed to support agricultural processing. Some are pre-permitted and have specialized wastewater treatment and disposal systems. Technical support is available from Washington State University, the Pacific Northwest National Laboratory, commodity groups and industry associations. Washington State University, a global leader in food and agriculture R&D, has numerous programs to assist processors in the state. Columbia Basin College is known for their agriculture, horticulture, and food system programs. A quality of life that supports transfer and recruitment of employees from other locations. The Tri-Cities is a remarkably sophisticated smaller metro area. The citizens of Benton County are among the best educated in the nation, with over 41% of its adult population holding bachelor’s or graduate degrees. A highly appealing natural setting. The Tri-Cities enjoys about 300 sunny days per year. Snow run-off feeds the Columbia, Snake and Yakima rivers. The local terrain ranges from about 400 feet above sea level in the river valleys to nearly 4,000 feet atop local mountains.